This is the perfect fall meal. Why is that? Because a sweater will hide the bulge this type of meal will create! I remember my mom making meatloaf and mashed potatoes and then the next day our school lunch was these. I could never wait to get to lunch (same with today). So I was thinking about the sandwich and figured I had to make the meatloaf meal so I could get to the sandwich. I didn’t make the standard meatloaf primarily because I never have that much ketchup in my house. I also like a slightly more Italian taste. Like my mom, I paired with mashed potatoes. Mix EVERYTHING in a bowl with your hands. It’ll be messy- don’t let your kid do it because it’s raw meat- I don’t know about your kid- but Z WOULD lick her fingers out of habit- gross. Spray a loaf pan with some type of oil spray. Put the meat mixture in the pan, molding as you go. Place the meatloaf in the oven and bake for 45 minutes. After 45 minutes, tip pan (carefully!) to drain fat grease. If you like that ketchup-y red sauce on top- Add some ketchup to the top and spread thinly- I have a memory of my mom also putting triangles of American cheese- but that doesn’t seem like my mom so maybe my memory is playing tricks on me :-). Place grease drained, ketchup laden meatloaf back into the oven for another 15 minutes. Voila! Extra special meatloaf that is juicy and delightful! Boil water and potatoes, covering the potatoes with water. Boil potatoes until you can pierce them easily with a fork. Put potatoes in a bowl and mash with a fork. Add butter and mix through. This is when I hand the operation over to Z- who has been a mashed potato hater HER WHOLE LIFE. I promised her we would make these so delicious that she would love them. She was up for the challenge. We added the sour cream and pepper and stirred, then milk and salt and stirred. Then, to get them super smooth (I usually like them lumpy, but Zara was driving the operation at this point) we transferred the potatoes to our kitchen aid and let it whip! Next- to build your amazing leftover sandwich. Get one piece of hearty, thick bread. I like to use a multigrain. Heat potatoes and meatloaf in the microwave. Slice bread in half, load your meatloaf slice and then spread your potatoes on top. Seal with final piece of bread. 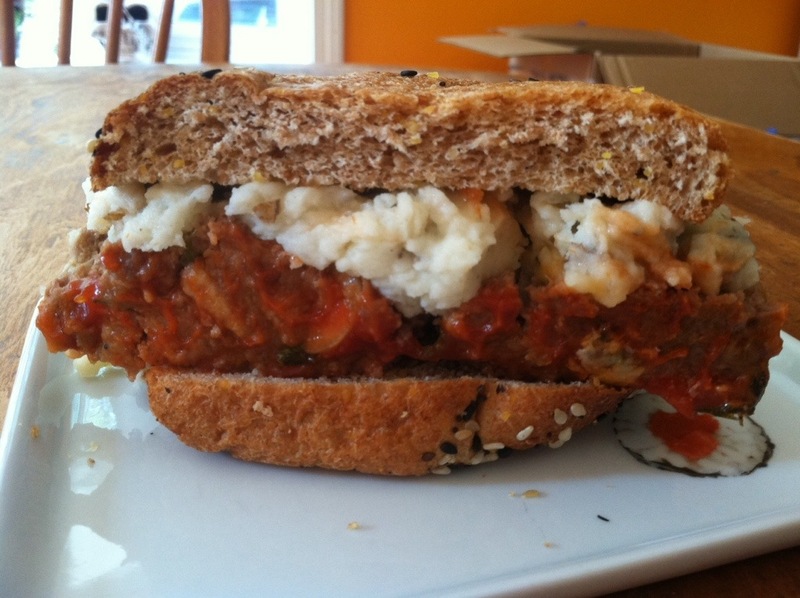 It may look not so fantastic- but trust me this is a sandwich you will dream about.